And start giving...It's a beautiful day and I am at CNN Center meeting up with Jennifer Jaki Johnson, author of the book, "Chess Game Of Life". We grab a couple of hot cocoas from Starbucks and squat at a table in the middle of the busy public atrium. This young lady interests me for a several reasons, but mainly I'm attracted to her passion and drive to help others - you'll see why. I met Jennifer a few years ago when she was still a student at Spelman and had won a scholarship to the WICT Conference in New York. This particular year, Suze Orman was the guest speaker at the conference and Jennifer got in line to ask a question. I'll never forget Jennifer's question, or Suze's response! Let's just say Jennifer committed one of Suze's faux pas and got the "bad girl" lecture from Suze. Even more, I remember thinking Jennifer handled herself well, had great presence, was very articulate and outgoing. She did not let fear of asking a personal question to a celebrity at a large conference in front of hundreds of professional women in the cable industry stop her from getting what she needed. Then I thought to myself, "I'll see her again." I was right. Jennifer is in the process of writing her book, "Chess Game of Life: 7 Strategies to Get Unstuck When Life Throws You a Checkmate". Jennifer has been able to incorporate in one book, not only strategies for navigating certain pitfalls of life, she also has powerful stories to give the readers context, and interviews from two well known women who overcame struggles to achieve success: Cathy Hughes of Radio One/TV One, and Grammy Award Winner Fantasia Barrino. The book will highlight Jennifer's own life stories to help teens and young adults make strategic choices in situations that could derail them for life. She is using her plight from her teenage years to give wisdom to those who may find themselves on a similar path to destruction. Jennifer's powerful message of how she overcame is what today's teens, young adults, and parents, need to hear. Stacey: Why do you feel compelled to share your story? Jennifer: I honestly did not feel compelled because of the vulnerability factor. I didn't fit the stereotype of what people would think who a teen mom would be. It was almost like I was living two lives because I was in college and lived on campus and people didn't know that I was a mom. I didn't want to be perceived that I couldn't I could achieve my goals because I was a parent already. It was only after people got to know me that they were amazed and wanted me to talk to others about my story. Stacey: What was it about you that made you feel you could overcome? Jennifer: I never felt that I wasn't going to be successful or OK. When I was in bootcamp at the age of 14, the juvenile correctional officers there couldn't understand why I was there. I brought my GPA up, tutored other young ladies, taught myself calculus, I was always a go-getter. I'm always challenging myself and looking to see what I can do. I always think things through and I'm strategic about my risks. Stacey: When were you the pawn? Jennifer: I didn't know what it really meant to have a child. I had a long conversation with my mom who said she would help me and I handed over the "co-mom" keys to her. It was a long, emotional conversation. The first sacrifice was allowing my son to be raised by my mom and I didn't get to see him everyday. At that moment, I didn't feel equipped to be a mom. Stacey: What do you say to mothers who currently have a teen going down the "wrong path" and may be ready to give up? Jennifer: Sometimes you have to do what you have to do. In hindsight, it was good that my mom put me in bootcamp because it opened up my eyes. Ultimately you have to get your young person back on track. They are listening, it's when they choose to listen that they can grow from it. Stacey: If you could do one thing different from your past, what would that be? Jennifer: I would have waited to have my son. Some people say don't change anything. I would have wanted to have them when I was older so I could spend more time with them, and I would have had an opportunity to accomplish more. It has been a challenge because we (my sons and I) were growing up at the same time I would have also wanted my mom to live her life the way she wanted. I don't regret them, I just would have waited. Stacey: What's next for Jennifer? Jennifer: The next step for Jennifer is to inspire and motivate millions of lives, youths and young adults, and women on the rise to become strategic leaders and change agents of their futures and surrounding communities. The goal is definitely to be a national speaker and continue to publish books. If you have a child (young or not), nieces or nephews, (or not), I challenge you to support Jennifer's cause for the sake of the next generation of leaders. The responsibility we all have is to further the good that we see by doing what we can. Take a look at "Chess Game of Life" on Kickstarter and be a change agent through giving. My "do something different" was to stop talking and start giving. What will you do different today? Jaki has continued to be a positive influence in the community and the change we want to see. 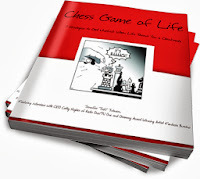 Please make a difference today and support her book campaign for the Chess Game of Life on Kickstarter which ends on Oct 29th, get your name in the book credits and/or have books sent to a high school or college!